Activist, writer and leader of the Indigenous Environmental Network’s (IEN) tar sands campaign, Clayton Thomas-Muller is simply one of the most outspoken, engaging, and compassionate opponents to the tar sands mega-projects. 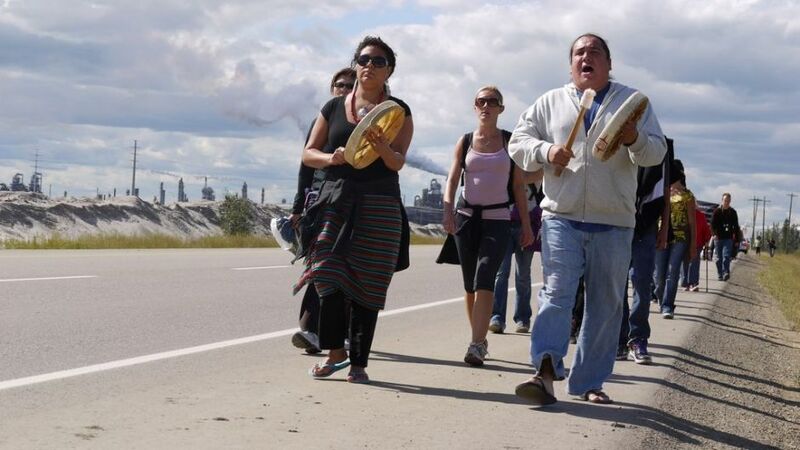 If recent efforts by Canada’s governing Conservative Party to rebrand the tar sands as “ethical oil” suggest a strategy for pacifying civic concern, Thomas-Muller’s belief in the growing political power of First Nations suggests a vital source of continued vigilance. Below are some excerpts from a long and illuminating conversation. Q: Clayton, could you start with an update on what you’ve been up to with the IEN and otherwise. How have some of your stated goals — of increasing awareness, of internationalizing the tar sands struggle, of building solidarity — played out in the last few months? Any personal highlights in terms of people you’ve met or stories you’ve heard along the way? A: I think the last couple of months have been full of all kinds of very significant steps. We recently completed a very high profile initiative — leading a delegation of North American indigenous people to attend the UN convention on climate change [conference]. Our purpose pertaining to tar sands was to elevate the issue of one of the most contentious decisions that the [United States] Secretary of State Hillary Clinton is presiding over — that is to either approve or disapprove of the Keystone XL Pipeline, which if built would raise tar sands extraction by over 30%. … [I]t was really exciting! Ours was the first highly visible action that went off at the UN framework convention. Right at the beginning of the summit, we unveiled a huge human banner that said ‘Shut Down the Tar Sands’ on everybody’s t-shirt — this was a big highlight for me — and at the same time, our affiliate Environmental Justice Toronto shut down Bay Street with a tripod action, with a similar banner saying “Tar Sands Kill, Pipelines Spill”. Meanwhile in the US capitol, we had delegation of about 20 tribal representatives to meet with the US State Department to discuss their issues with the proposed Keystone XL pipeline. So for me, the last couple of months have shown a growing capacity of the grassroots network in the indigenous tar sands campaign. Q: It sounds that way. But I want to contextualize this with respect to some of your own writings about the general lack of indigenous involvement in anti-tar sands campaigns — noting the dependencies in some First Nations communities on the fossil fuel economy (e.g., jobs). Can you speak to that challenge? A: What has our campaign done to lessen the economic dependency on tar sands? Not a heck of a lot. The sad reality of these five Athabasca Tribal Council First Nations and the handful of other Nations from Treaty 6 [a treaty area in central Saskatchewan and Alberta] and elsewhere is that 86% of revenue streams coming into these settlements depend upon tar sands contracts. I think this dependence is not just reflective of First Nations communities; it is also reflective of all the other municipalities. But I think that for us, what we understand — what we’ve always understood — is that this is not a new thing. We long needed to flip the power game, to flip the power paradigm. For those that use tar sands as a means to lubricate and usher in the new energy economy [i.e., the dubious myth of building toward at a green economy through oil revenues] — to create jobs, etc. — I would reply that these realities are not possible without addressing the Indian question. The work that IEN is involved in is really about a long term vision. The Canadian legal landscape is very quickly changing. The case law backing aboriginal rights land claims is growing. The area of aboriginal law is very rapidly expanding. And it provides certain power to the most marginalized population in the Canadian economy. This is all happening at a time when there are some basic numbers that we have to take into consideration: 75% of all the Native people in this country are under the age of 30. One out of every 4 workers in this country is going to be Native by 2015. So, we’ve got a massive transference of power — political, legal, economic — and I would argue spiritual, to the most marginalized population in this country. So what have we done directly on the economic question? Not much. But First Nations people will have a very significant leadership, I think, in the new economic paradigm, and our present work has very much been about laying the brickwork for this. Q: How would you compare experiences with tar sands consciousness raising in Canada with America? How has the state — in each instance — affected the potentials for network building? How would you characterize the opportunities for networks and connections to form between NGOs, and broader publics, and First Nations across these countries? A. What it comes down to is that both sides have not been the best allies when it comes to the concerns that First Nations have raised — pertaining to human health, pertaining to the erosion of treaty and Aboriginal rights, pertaining to the destruction of traditional way of life… the list is long. But the other thing that we know is the differences in the response to tribal intervention. The trust relationship in America between the US State Department and the tribes and the trust relationship here in Canada between the Crown and the First Nations is very different. In America, they take tribal sovereignty very seriously. Environmental policy, and the number of legal avenues for tribes to take to intervene on mega projects, is very different from what’s available to First Nations here in Canada. I mean, they have a tribal environmental protection program which is part of the National Environmental Policy Act, which tribes can apply to so as to get their own environmental scientists, their own tribal environmental codes… there are many instances of tribes having their own water quality and air quality standards. I think the Northern Cheyenne in Montana are the best example — they have their own tribal EPA water quality standards and water quality data that is recognized as the best data in the country. This, compared to any municipality in the United States! We in Canada virtually [have] no environmental policy… This puts First Nations in a very precarious position when they are trying to assert sovereignty. From the First Nations perspective to negotiate over land claims with the provincial entity is an erosion of First Nations sovereignty — and it’s an erosion of the trust we have defined by the Indian Act, defined by Section 35, and defined by existing case law. A: IEN, through our campaign on the Keystone XL, have been able to organize twelve tribes from Montana all the way to the Gulf of Mexico to adopt tribal resolutions in response the imposition of the pipeline. What has this resulted in? A meeting between the US State Department and these tribes specific to the Keystone XL. Now in Canada, do you see that kind of meeting happening? In Canada, the First Nations are left to deal with Canadian Association of Petroleum Producers, the National Energy Board, the ERCB [Energy Resources and Conservation Board] — all these different regulatory bodies that are multi-stakeholder in design, that stack the cards against First Nations, that separate them from other stakeholders within the Canadian context. But while it’s very different, one final thing I would add [in response to question 3] is that both governments have severely agitated against tribal intervention over tar sands expansion — especially when the issue is of actual physical development itself. Q: In a speech at PowerShift you characterized climate justice as the civil rights issue of your generation. I’m wondering: have there been any efforts to reach out to the civil rights community in America and elsewhere — especially as it pertains to continuities between that struggle and this present struggle? We have a responsibility when we look at the discourse around the implementation of climate policy. We have to take the ecological debt that is owed by the state to the communities that have suffered disproportionately as a result of the current economic paradigm governed by the fossil fuel regime — we have to develop a just transition model that allocates revenues generated by public sector climate policy mechanisms such as penalties against emitters that violate laws on emissions or financing programs set up by the re-diversion of military spending and oil and coal subsidies to zero carbon investments, and we have to keep them out of the private sector, we have to keep them out of the carbon markets. Q: You brought up the environmental movement several times there. I wonder if we could touch on the corporatization of environmentalism. Petr Cizek [land use planner and critical cartographer], who I interviewed previously, was quite trenchant in his critique of Ducks Unlimited, a group financially connected to Suncor through the Pew Charitable Trusts. What sorts of problems do you observe regarding the differentiated aims of different environmental groups working on the tar sands? And to what extent do their efforts undermine the sorts of things you would like to see happen, and have just described? But what IEN argues is that time ran out a long time ago for our communities. Issues like the tar sands are already matters of life and death for our communities — there have been over 100 deaths in Fort Chip in the past 10 years as a result of tar sands. My whole thing, to get back to Petr’s analysis, is yes, there are some power issues around transparency and accountability within the mainstream environmental movement and the foundations that support that movement, heck within the whole non-profit industrial complex. And yes, some very real ties to corporate agenda. But IEN takes our direction from frontline endangered communities who are the most marginalized community in the country, and we don’t write off any groups that our communities don’t tell us to write off. We view people either as allies or as tactical allies. Ducks Unlimited have in many many instances gone to court against First Nations in Canada and the US — challenging tribal sovereignty — to push their conservation agenda forward, to keep conservation lands in the hands of white conversation organizations. All of that ain’t new to us. We’ve been dealing with the same power games for a long time. So we focus our attention, rather, on expanding the political base of our communities and our allies and targeting the power sources which are driving this model of co-optation and oppression. This interview originally appeared on raventrust.com, where it includes two further questions. RAVEN is a charitable organization that provides financial resources to assist Aboriginal Nations within Canada in lawfully forcing industrial development to be reconciled with their traditional ways of life, and in a manner that addresses global warming or other ecological sustainability challenges. In Depth on Indigenous Rights in the Tar Sands by Max Ritts is licensed under a Creative Commons Attribution-NonCommercial-ShareAlike 3.0 Unported License. Max Ritts obtained his MA in Geography from the University of Toronto, where he wrote his Master’s thesis on questions of visual representation and political ecology in the context of the tar sands. He is currently working on a PhD in Geography at the University of British Columbia.